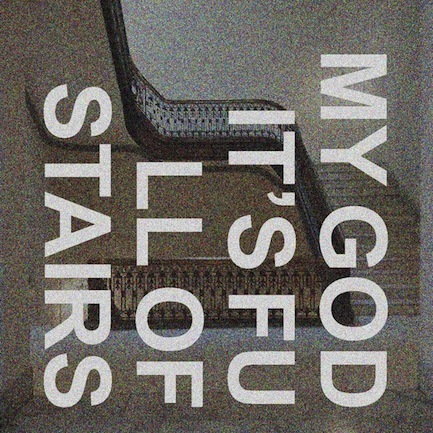 A new release from Trace Recordings: BLK TAG – My God, It’s Full Of Stairs. A 28 track remix and reconstruction album of BLK TAG’s recent release; ‘A Distilled + Debilitating Loneliness’. The album features remixes by, amongst others, Anduin, Chester Hawkins, Guillermo Pizzaro, Building Castles Out Of Matchsticks, Raf and O, ONE CHORD PONIES, Daniel Barbiero and Gary Rouzer, Rothko, un[KNWN] to name but a few. Ah, to name. For this project participants were asked to name their contributions with wordplay based on titles from the original BLK TAG release. And so my and Gary’s contribution, De Stijl & a Mitigated Dronelessness, began as a title groping toward a sound. A ground track was created by taking a drone from the original BLK TAG recording of A Distilled and Debilitating Loneliness and running several passes of noise reduction through it, using brief passages from the track as samples of the frequencies to be eliminated. Removing the drone from the drone, as it were. The results were then run through a granular synthesizer program. A live partly scored, partly improvised duet of prepared Califone and double bass, recorded in the Pyramid Atlantic vault, was added to the ground to create a continuo. A live performance from the Back Alley Theater was then layered on top, along with a scored solo performance for cello. Scores were created from excerpts of visual poetry written by Theo van Doesburg under the pseudonym I. K. Bonset. Daniel Barbiero: double bass, granular synthesizer & allusions. Gary Rouzer: prepared Califone, cello, objects. Mixed by Daniel Barbiero & the Little Grey Studio Elf, October 2014. Available as a download for a mere 7 UK pounds. Get it at Trace Recordings.